Exerting all of your energy while trying to paddle out, falling off of the board, and enduring the constant crash of waves on top of you may not sound like a great day, but the exhilarating feeling of catching your first wave and learning a new sport is California’s most awesome adventure. It wouldn’t be a proper visit to California without surfing. When I heard that my brother, Kevin, was going to visit, I knew the number one thing on his California Bucket List would be a surf lesson. 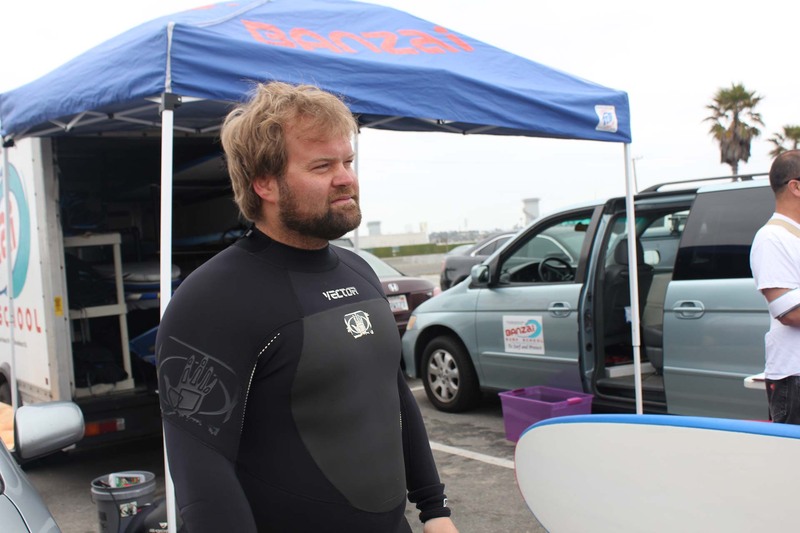 Banzai Surf School is a family run business and one of the few NSSIA accredited surf schools in Huntington Beach. 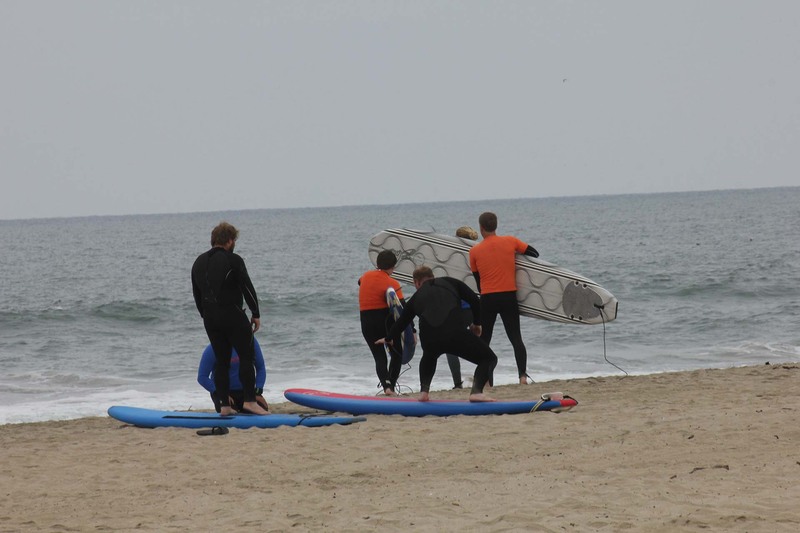 Open year-round, they provide experienced instructors, surfboards, wetsuits, and all the sand you can eat. Our lesson wasn’t without its falls and frustrations but our determination and drive got us up on the board again and again. Rule 1: Avoid crowds. The biggest danger in surfing is not the waves, the rocks, the sharks, or the marine life. It’s other surfers. Always try to keep at least 20 feet between you and the next surfer, especially important if they are to the outside (toward the ocean) or directly inside/shoreward of your position, where you may get pushed into them. Rule 2: Practice in the whitewater first. One of the hardest parts of surfing will always be the take-off. If you start out by catching the whitewater (after the wave has broken), this eliminates a huge timing issue. Rule 3: Paddle the board on its trim spot. That trim spot on bigger boards is generally found by keeping your toes on the tail when you paddle. It’s the balance point where the board moves forward with the least resistance. The same trim rule applies when you’re riding the wave: Keep your weight forward and the boards nose just above the water. Rule 4: Stand with your feet on the center line. Keeping both feet, one in front of the other, directly across the center line (or ‘stringer’) fixes a lot of problems. When feet are on either side, the board wobbles, flips, and turns where you don’t want it to. 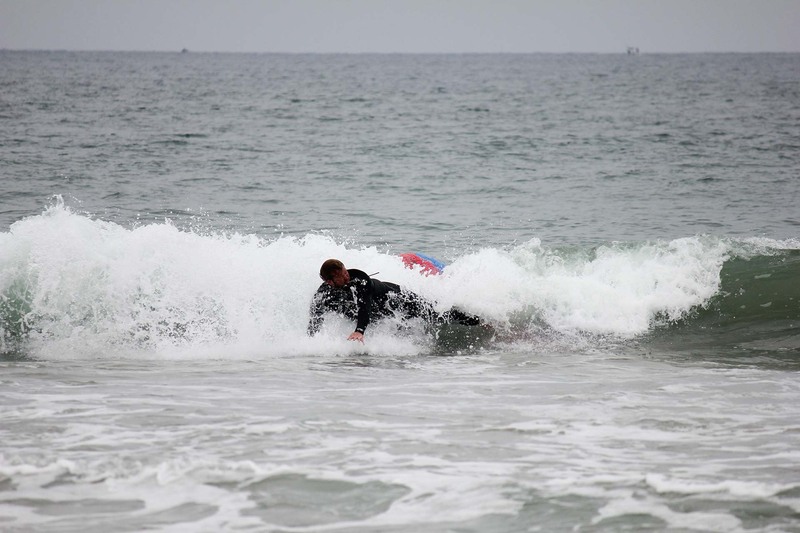 There’s a ton of other safety issues, skills, and fine tuning that the surf instructor gave us while in the water; after all, surfing can’t be learned from a book – there are too many variables. at first. We took each wipe out like champs and kept on truckin’.Kevin’s entire body exuded confidence and pride when he stood on the board. Normally two hours of intense physical activity would be completely exhausting, but the adrenaline that consumed both of us pushed thoughts of quitting out of our minds. Surprisingly, even after our two hour lesson time ended, the instructor stayed in the water and let us continue. It was obvious that teaching others to surf wasn’t just a job for him. He was having as much fun as us. It was his reassurance and hard work that helped us get on the board in the first place. 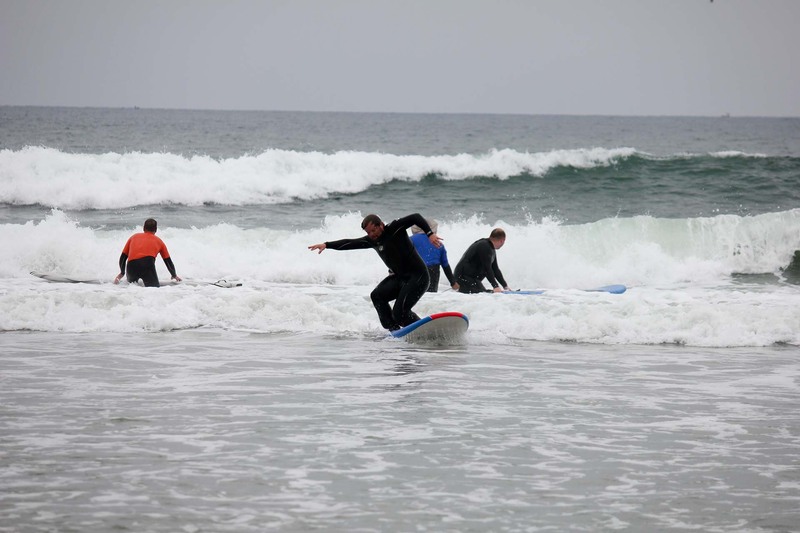 Kevin viewed the surf lesson as a wise investment that saved time and frustration. He used the local knowledge from the instructor to practice on his own throughout the week. One two-hour lesson gave him the confidence to get out on the water on his own and enjoy the surf of Surf City USA.For me, it was an affirmation that with practice and patience, I could make surfing a daily activity. It’s like riding a bike; it will become second nature… in time. 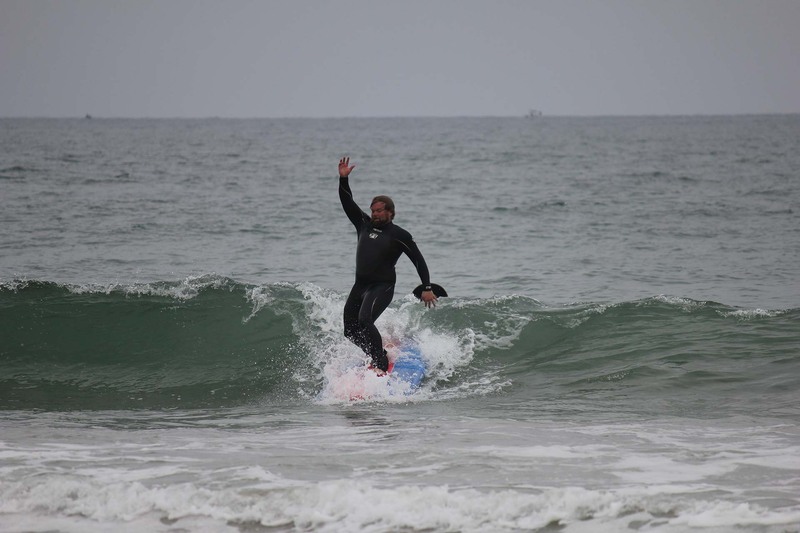 This entry was posted in California, California Outdoors, Reviews, Travel, USA and tagged Adrenaline, adventure, bucket list, Bucket List Publications, California, Huntington Beach, Lesley Carter, lessons, SoCal, southern California, surf lesson, surfing, travel, USA, vacation by lesleycarter. Bookmark the permalink. I’ve harbored a secret desire to try surfing for years, and since I live in Hawaii, I’ve no excuse (although I’ve found plenty). After reading this post, maybe now I’ll actually do it. Great tips, btw. Surfing is cool and I like the pictures. UK has a lot of coast and some surfing areas. Perhaps need to have some lessons. Newquay here we come. I used to surf when I was in my late teens and still time to time, I remember how wonderful it was. Guessing from the full wetsuits, the water there seems pretty cold? 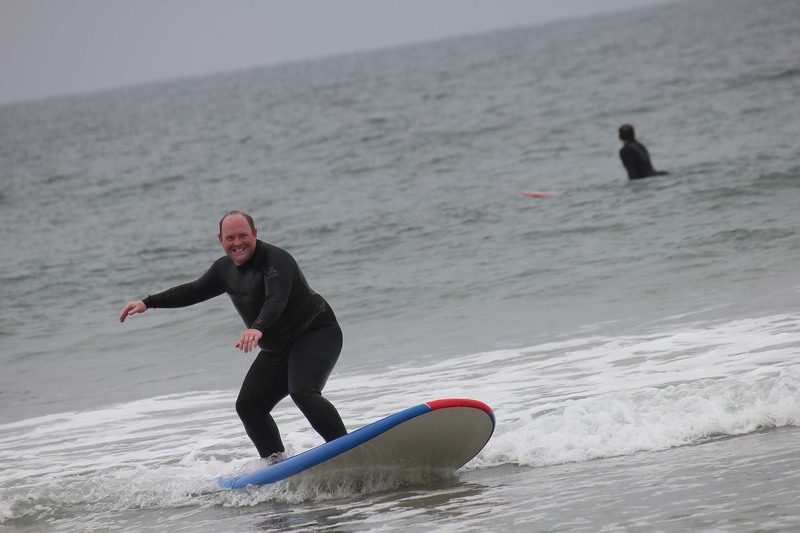 I may try the lesson next time I am in Huntington Beach! Great article. I’m going to be signing my son and I am surfing lessons in cocoa Beach Florida this summer. Great blog! It made me miss spending my summers back in high school spent at Newport beach. although it would seem that Darrin is having more fun! This is such daring stuff.For eyes only!!! 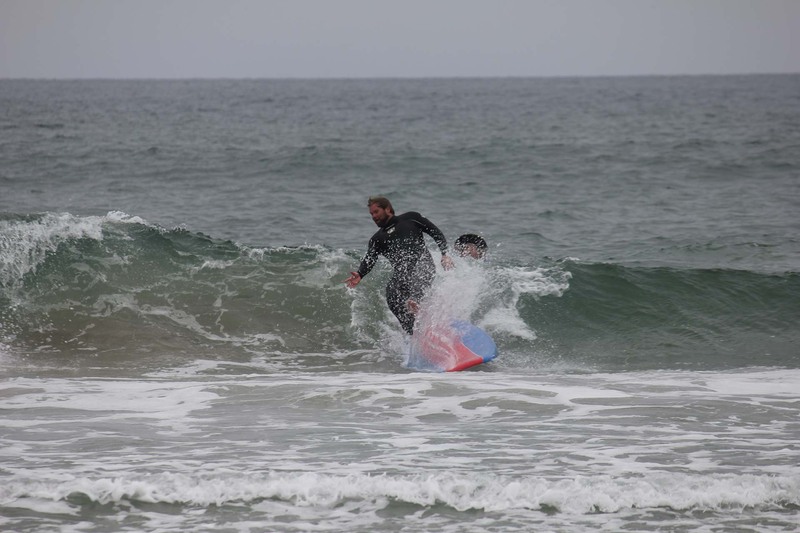 I’ve had a hip-pocket body boarding lesson before. Bottom-line, I dread what happens if my bodyboard got away and I have nothing to float on. I don’t know really know how to swim. Hehe 😀 A friend of mine from Hawaii is soooo passionate about it. He always makes me interested with surfing. Absolutely on my bucket list to learn to surf when my kids are a little older! Always wished I had learned to do this. Didn’t start snowboarding until I was 50, so there is time yet I suppose. I might try surfing this summer. Love this post! 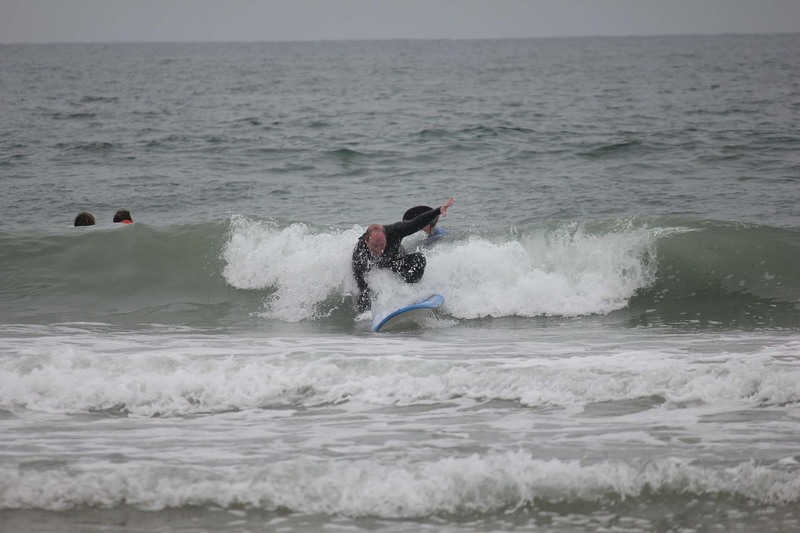 Reminds me when I was learning to surf…. which I am still learning. We go surfing down in the OuterBanks of North Carolina. It’s nothing like California waves I’m sure! 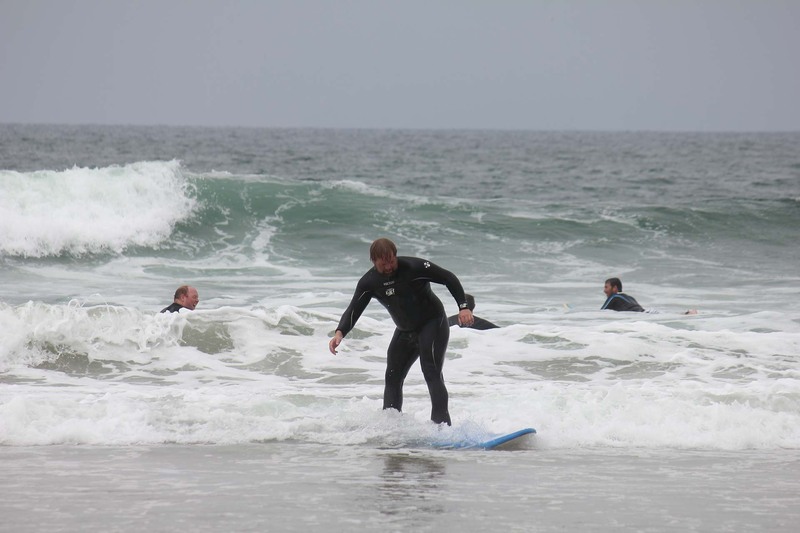 My husband and all his brothers have been surfing for years… they especially love the hurricane waves. I’d love to learn to surf. Not being graceful or coordinated should make for an excellent experience. I wish I was as adventurous. It looks like such fun. Trouble is my knees would give out and I’d drown but I DO like watching. LOL. 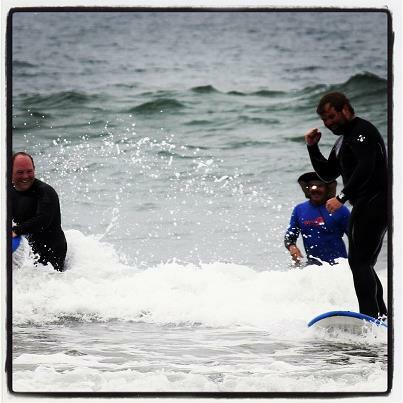 My husband and I took surfing lessons in New Zealand a few years ago. It was a lot of fun. Unfortunately, we didn’t get pictures. Exhilirating and thrilling! !… Just like my passion of cooking and writing 🙂 good! Thanks for the insightful info, will keep digging more. One of my smaller dreams/goals is to move to SoCal as part of my own journeys and learn to surf (without any prior experience, I might add, but love challenges) maybe in Venice Beach. Loved that place! Anyway, thanks!